Plotz wrote an article for Slate inviting readers to contact him–confidentially–if they knew anything about the bank. The next morning, he received an email response, then another, and another–each person desperate to talk about something they had kept hidden for years. 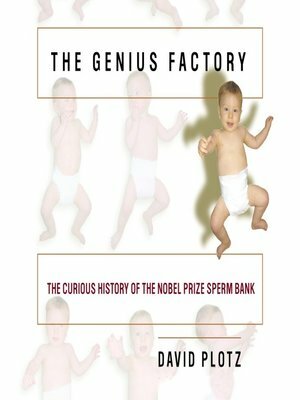 Now, in The Genius Factory, Plotz unfolds the full and astonishing story of the Nobel Prize sperm bank and its founder's radical scheme to change our world. Believing America was facing genetic catastrophe, Robert Graham, an eccentric millionaire, decided he could reverse the decline by artificially inseminating women with the sperm of geniuses. In February 1980, Graham opened the Repository for Germinal Choice and stocked it with the seed of gifted scientists, inventors, and thinkers. Over the next nineteen years, Graham's "genius factory" produced more than two hundred children. What happened to them? Were they the brilliant offspring that Graham expected? Did any of the "superman" fathers care about the unknown sons and daughters who bore their genes? What were the mothers like? The children of the "genius factory" are messengers from the future–a future that is bearing down on us fast. What will families be like when parents routinely "shop" for their kids' genes? What will children be like when they're programmed for greatness? In this stunning, eye-opening book, one of our finest young journalists previews America's coming age of genetic expectations.